She Starts Cutting Into A Pringles Can. When She Puts It In The Bathroom? Everyone Should Do THIS! There is nothing quite like sitting down with a nice bag of potato chips but sometimes, we may prefer a can. Personally, I love Pringles and I have to agree with the statement that you can’t eat just one. As far as chips are concerned, it is at the top of my list and that is even more so now that I know about this project. For years, I would empty Pringles cans and then toss them to the curb after I was finished. As it turns out, I was making a huge mistake all along. The container is useful for so many different purposes and once you understand the usefulness, you may never throw away another Pringles can again. In fact, I have started to get my friends and family to save them for me. Some of the DIY projects can be used in areas outside of the home but there are also many areas of the home that can benefit from a spare Pringles can here or there. You might be able to think of a few off the top of your head but you likely aren’t thinking of them all. Here are a few of our favorite ways that we use the can after our favorite chips are gone. 1. Plastic bags – your drawers are likely overwhelmed with grocery bags but if you cut a hole in the lid and push the bags inside of an old Pringles can, they come out neatly. 2. Giving away cookies – don’t give away your plastic containers along with cookies you’ve made. Make these amazing giveaway containers using old Pringles cans. 3. Cotton pads – you can decorate old cans of Pringles and cut a hole in the bottom, as is shown in this picture. You have something awesome for your bathroom counter to dispense cotton pads. 4. Storing pasta – spaghetti noodles fit perfectly inside of a Pringles can. Who knew? 5. Paint rollers – how do you dispose of your old paint rollers? Why not put them inside of a Pringles can, squeeze and pull them from the handle. How simple! 6. Candlesticks – you can wrap twine around an old can of Pringles and drop a candle inside. 7. Phone speaker – An old ship container can amplify the sound of a phone nicely. 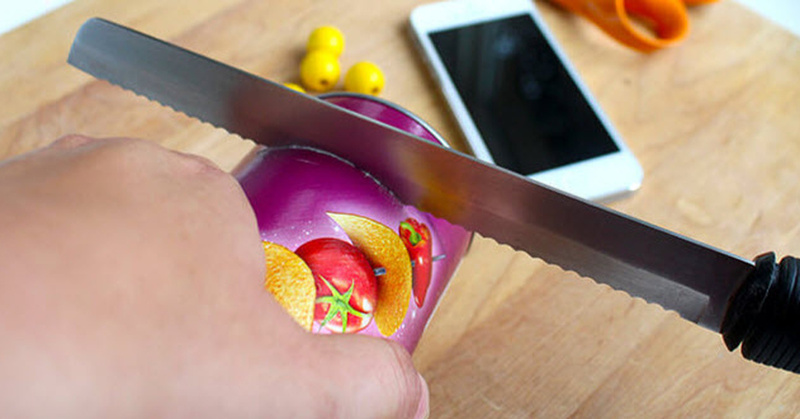 cut a hole in the Pringles can to fit your phone and you will have a nice amplifier. 8. Hair straightener – when you use a hair straightener, you can keep it neatly tucked away using the Pringles can. 9. Flowers – you can stick a plastic bag in a Pringles container to hold water and you have a makeshift flower vase.